Fifty-seven million Americans suffer from low bone density or osteoporosis, a disease which causes bones to become so weak and brittle that even a minor fall or other stresses may cause fractures. A study published in the British Journal of Nutrition in July examined the mechanism of the bone-protective properties of an unlikely source—California dried plums. To further understand the mechanism by which dried plums (prunes) improve bone health, researchers from San Diego State University and Florida State University used data collected from a previous 12-month clinical trial that compared the bone-protective effects of dried plums and dried apples. Results from this clinical trial confirmed the bone-protective properties of dried plums, and several animal studies have also supported this finding. However, the mechanisms by which dried plums impart their bone-protective properties remain unclear. "While it is difficult to identify the exact mechanism behind dried plums' positive effect on bones, this study identified three potential pathways for the mechanism behind the effect of dried plums on bone resorption and bone formation," explains Dr. Shirin Hooshmand, PhD, Assistant Professor Department of Exercise and Nutritional Sciences at San Diego State University. "We are excited to continue to apply the results of this study to future research that may help us to determine the exact link between dried plums and healthy bones." During the original 12-month clinical trial, which was published in 2011 in the British Journal of Nutrition, 160 osteopenic, postmenopausal women were randomly assigned to eat either 100 grams dried plums (about 10 dried plums) daily or 75 grams dried apple daily. Each participant also received 500 milligrams of calcium plus a daily vitamin D supplement (400 international units). The results indicated that the group that consumed dried plums had significantly higher bone mineral density in the ulna (one of two long bones in the forearm) and spine, in comparison with the group that ate dried apples. This, according to study author and researcher Dr. Bahram H. Arjmandi, PhD, RD, Florida State University's Margaret A. Sitton Professor of the Department of Nutrition, Food and Exercise Sciences and Director of the Center for Advancing Exercise and Nutrition Research on Aging (CAENRA) in the College of Human Sciences, was due, in part, to the ability of dried plums to suppress the rate of bone resorption, or the breakdown of bone, which tends to exceed the rate of new bone growth as people age. "Nature has created dried plums to be unique in nutrient composition. They really are the whole package," explains Dr. Arjmandi. "In more than 15 years of research, I have never seen a fruit like dried plums. Research suggests that dried plums may actually help to regenerate bone in people who have experienced bone loss. This is a serious issue for men and women alike, and dried plums continue to show promising results in the prevention and reversal of bone loss." Results of additional animal studies which measured effects on bone mineral density are consistent, showing strong supporting evidence of an effect of dried plums on bone mineral density and/or markers of bone turnover. Collectively, both the human and animal studies indicate that adding dried plums to the diet may be an effective way to help support healthy bones. Dried plums help manage weight through improved satiety, perhaps by producing lower glucose and/or appetite-regulating hormone concentrations. Dried plums reduce LDL cholesterol in both animals and humans. 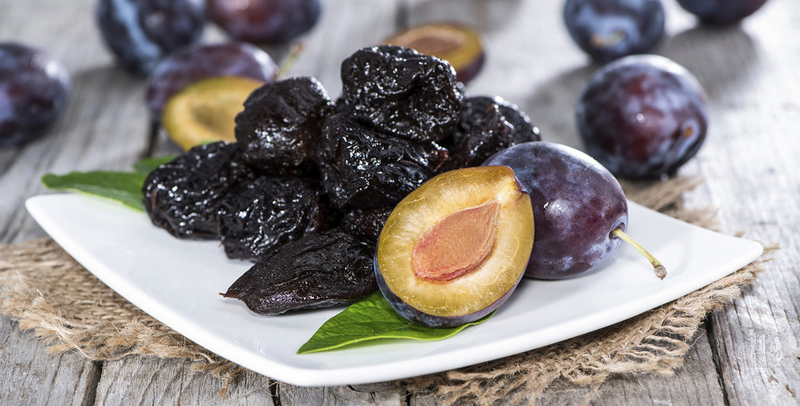 Dried plums promote digestive health and are palatable and more effective than psyllium for the treatment of mild to moderate constipation, and should be considered as first-line therapy. Dried plums are considered a low-glycemic index (GI) food, which means they are likely more satiating than high-GI foods and do not cause a large rise and fall in blood glucose levels and insulin response after a meal. The original 12-month clinical study published in 2011 was funded by the National Research Initiative of the USDA Cooperative State Research, Education and Extension Service. The California Dried Plum Board provided some funding for the study, as well as dried plums for participants.